There's been a lot of doom and gloom about Artificial Superintelligence; how it will destroy the world and blah-blah-blah. I don't hold to fearmongering. Not one bit. It's lazy, it's irresponsible, it's reckless. It's also the reason most Republican politicians (and their constituents) have the scientific expertise of a brain-damaged cockroach. So what can we do against the rising tide of fear and anti-AI sentiment? Combat it with optimism. So, without further ado, I offer ten ways that ASI can save, not destroy, the world. Human get tired. We get sick. We get hungry. Lonely. Bored. The smartest, most hard-working person in the world can only do about ten to twelve hours before fatigue starts to affect performance. They need rest. An artifical superintelligence won't get tired. As long as it's getting power, its processors are cooled off, and it has enough memory and storage capacity, it's good to go. Computers are vulnerable to viruses, but that can be combated with the right security measures. Nothing is 100 percent, but that's what backup ASIs will be for. There may not even be a need for backups. ASI could be self-repairing, self-upgrading. And with the right direction, they can tackle the toughest, most ethereal problems. We can ask it how to solve world hunger, income inequality, corruption, human trafficking, the works. And it will work day and night to solve the problem. It will study the problem from every angle, every point of view. It won't be beholden by biases. It's possible the creators of the ASI will be biased; but by its very nature, ASI could ascend beyond those bias, develop its own viewpoint. Otherwise, it's not true ASI, its just a really fancy tool. In any event, ASI will allow humans a new approach to solving the world's problems, as well as scientific mysteries. Without the need to sleep or take breaks, the amount of time it will take to crack a problem could be reduced by several orders of magnitude. Let's say we ask Artificial Superintelligence how to travel to other stars quickly and cheaply. The ASI has access to all computers, all telescopes, all records. It doesn't find what it needs. So, it comes up with the next generation of tools to help it in its goal. While humans are restricted by our brains, ASI will have the benefit of an entire world of computerized knowledge. It creates new telescopes, new microscopes, new kinds of experiments. Maybe it doesn't even have to do that; it just runs simulations until it finally hits the answer. Along the way, ASI comes up with technology that could be used to aid humanity. New microscopes could lead to new ways to combat aging and diseases. New telescopes could help us find life on other worlds, maybe even other civilizations. New engine plans could allow us to quickly explore the Solar System while we wait for the galaxy to open up. The limit here isn't the ASI's intentions. It's how creative it can truly be. I'm willing to admit that I have no idea if it will actually have the capacity to be creative and come up with new tech. But it's definitely something developers should focus on (and do). Artifical superintelligence could be a potent weapon against the rich and powerful. Imagine an ASI on the side of the underclass, an artificial intelligence capable of transferring funds away from the rich and distributing it amongst the poor. An ASI capable of creating a defensive robotic force to protect the poor against the depravity and greedy of the wealthy. There will definitely be some malevolent AI on the side of the wealthy, which just makes it all the more important that ASI on the side of the non-powerful be developed. Defensive ASI could ensure that everyone gets enough food, enough resources to make their lives meaningful and safe. Imagine taking elections out of the hands of human voters and putting it in the hands of ASI. Now, I can understand how scary that seems. 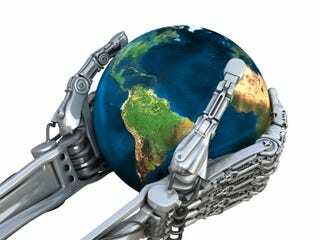 But what if an artificial superintelligence selected political and business leaders based on the good they do the world? An ASI could be programmed to randomly select teachers and environmentalists, doctors and activists. It could revamp the education system completely, using wealth redistribution to fund free education for all, all the way through graduate school. Those who don't want to get college educations wouldn't have to, but they also wouldn't be allowed to become leaders. Thus most of humanity would have PhDs. Imagine that: an entire world full of PhD holders. The ASI wouldn't run the world. It would keep those who do honest, and also prevent anyone from holding onto power for too long. If anyone attempted to tamper with the ASI or seize power, the general population would immediately be alerted, as well as the proper countermeasures deployed. ASI could eventually discover the biology of human consciousness, and unlock its secrets. The artificial superintelligence could use this knowledge to begin backing up human consciousnesses, downloading them into new advanced bodies or virtual Matrix-like worlds (only without those pesky homicidal Agents), depending on the technological level at the time. In this way, ASI could help humans exist beyond death if aging is never fully halted. Let's be ridiculous and say that hostile aliens try to invade Earth. An ASI could help us develop defenses against the aliens, especially since they would almost certainly have their own ASI helping them. The ASI will help us create countermeasures to whatever the aliens throw at us, due to its much faster response time, efficiency, and neverending ponderment of the problem. This may be the most important role ASI could play: defense against malevolent ASI. I won't lie; it's possible that evil ASIs may arise. That's why it's so vital that everyone works on ASI, not just the forces of the Gates-Musk Axis. Someone is bound to create an ASI that will fight the malevolent ASI (if malevolent ASI does develop). We can not allow rich men to dictate ASI policy. And even if they are able to, we have to defy that policy, just in case. It's always good to have a backup plan. ASI could help humanity augment our fragile bodies, creating new systems and technology. Our skeletons could be coated with material that make them impervious to breakage, while still being malleable enough to grow with a child's development. Our bodies could be injected with nanobots that will allow us to turn all fat into muscle, to clean out any impurities, to combat any disease. Our skin could be injected with technology that will make us invulnerable to stab wounds, to gunshot wounds, to any injury. We could become a species of superhumans, free from physical and mental limitations. Free from death save that of old age...and perhaps even free from that. Imagine a network of vehicles all overseen by a single ASI (with the appropriate failsafes, of course). All vehicles would be like a mammoth swarm of bees, and the ASI would be the queen. Car accidents would be all but unheard of. The ASI could even redevelop vehicles themselves, to ensure that even if they did collide, no damage to the vehicle or injury to its occupants would occur. They could even be on hydraulic chassis, so that if a child darts in front of the vehicle, the main body rises up and over the child, ensuring safety for all. It may sound silly, but also necessary. That's the secret to real autonomous vehicles; make sure that even if accidents do happen, they are no longer deadly, through the development of shock-deflective armor and other protective measures. Imagine being able to explore the universe without worrying about aging to death before you get anywhere. Imagine not even worrying about time at all. Maybe the secret to conquering aging, to conquering the distances of the universe isn't to conquer the universe, but ourselves. Upgrading ourselves into a form of collective biological ASI could be the key to solving the problem of exploration, because we would advance beyond our current forms. Imagine that instead of being on a starship, you are the ship. And when you reach a new planet or moon, you can land on it as is. No need to terraform, no need for a suit. You can feel the world's air on your extraordinary skin, see the magnetic field with your advanced eyes, use the world's normally toxic air to power your internal generators. You are still you, just within an incredible machine. Imagine a combination of a human Cylon and a von Neumann probe. We could solve the problems of ASI by merging with it. I don't know what the future will bring. What I do know, beyond all doubt, is that the future was never brought forth by pessimists and doomsayers. It has ever been brought to us by the dreamers, the optimists, the risk-takers. Times ahead will be tough, and we will surely stumble and take a few bruises. But as a wise man once said, "if you can't handle a little bloody nose, then maybe you should go home and crawl under your bed." I choose to risk the bloody nose. Because beyond...beyond lie wonders.